There is a neighborhood in Miami called, simply, “The Roads”. It is located southwest of Downtown Miami. 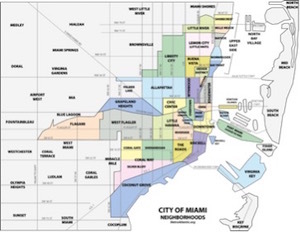 Better known neighborhoods, such as Coconut Grove and Brickell are just east of The Roads. While it is primarily a homeowner neighborhood, there are numerous schools, religious centers and dining establishments within The Roads neighborhood. The religious centers include Saints Peter and Paul Catholic Church, Beth David Congregation, St. Sophia Greek Orthodox Church and SGI-USA Buddhist Center. The restaurants offer a wide variety of selections including French, Greek and Venezuelan. A number of professional offices are located in The Roads including the slip and fall lawyers at The Wolfson Law Firm where they have been helping injured people since 1963. Whether you are in a school, religious center, private home or a commercial dining establishment it is important to know your rights. You have a right to expect that the owner of a property will not expose you to unreasonable danger and harm. You have a right to expect the floors and grounds to be well maintained. If the floor or ground is in need of repair or cleaning, the property owner has the duty to warn you of the hazardous condition. Does it matter who owns the property when you are injured? In short, the answer is yes. If it is a public property such as a school, police station, sidewalks, curbs then the rules under the law are different. First, you need to figure out what public entity is responsible for the condition that caused your injury. It could be the City of Miami or Miami-Dade County or the state of Florida. The reason you need to figure out which public agency is responsible is because you have to give them notice. Under the Florida law, a public entity, agency or political subdivision is entitled to six month notice. During these six months, you cannot file a lawsuit unless they public agency, entity or political subdivision specifically denies your claim. If you file suit without giving notice or file without waiting the required 6 months, the court will dismiss your case. This one of the many reasons why it is crucial to get the advice of premise liability lawyer so they can guide you through the procedural steps necessary to get the damages you may be entitled to recover. If you get hurt on property owned by an individual or a commercial entity, then you do not need to wait 6 months to file a lawsuit. But you will likely need to deal with property managers, insurance companies and possibly defense attorneys. If you are injured because a property owner did not maintain their property correctly or they failed to warn you of a dangerous condition, then you may be entitled to monetary damages which can include not only your medical bills and expenses, but also your lost time from work, as well as compensation for pain, suffering and humiliation. A slip and fall lawyer can help you investigate the facts of your trip or slip and fall. Documentation of your fall is critically important because you can never rely on the property owner to help you make your case. A slip and fall attorney can also deal with property owners, insurance companies and defense attorneys. Whether you slipped or tripped and fell, The Wolfson Law Firm can help you today. Just call us at (305) 285-1115 and come in for a free consultation.